Also called Epernay II. Produces fine white wines with fruity/estery aromas. A steady, yet moderate to slow fermenter, it is easy to stop fermentation in cases where residual sugar is desired. Recommended for fruit wines, ciders and meads as well. Ferments from 50 to 80 degrees. Makes a great dry peach wine. New to mead making and reading about this yeast peaked my interests so I wanted to give it a shot! I use this yeast for one of my licensed, trademarked wine. 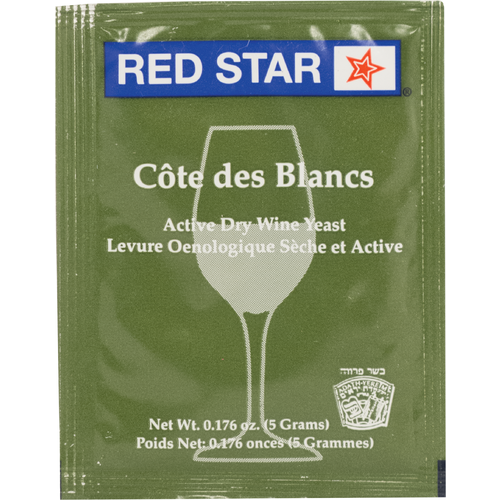 I am a small winery, I'm hoping with the Pro program that I will be able to purchase this yeast in 500 gram packages. so easy and good. Thank you. This is my wife's go to choice of wine yeast! Currently sampling some cherry wine which has been bottled for over a year. Very sweet finish! Wish we would have made more. This is my go-to yeast for cider. Ferments dry, but still preserves the apple flavor.